How is your company handling access control? Access control is one of the most important elements of a company’s security system. 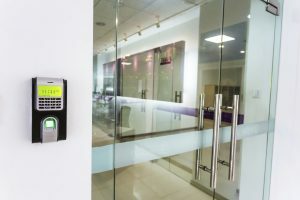 Though it was once only a small part of a complete security system, access control is becoming more and more sophisticated as well as integral with emerging technology. Today we’re going to be talking about how access control and the role it is playing within the larger security environment. What is the point of access control? Access control is a term that is used to describe a variety of devices that all serve one purpose. That purpose is to provide a barrier that only authorized individuals can penetrate. These barriers can exist on the perimeter of an area, within an area, or even within a computer network. Things like doors with locks classify as access control devices. Iris recognition technology is in the same family, though it is far more developed and much harder to fool. Relying on physical credentials can be limiting. Things like keycards and keys are very common methods of access control, but are they as secure as they could be? Well, that depends on how well the keys and keycards are guarded. After all, access will be granted to anyone who holds the key. PIN numbers can also be challenging to secure if they are ever written down or shared among several staff members. However, there is another option. Biometics hold the key to the future of security. The prevalence of keycard usage can be pinned down to the fact that they have a history of being much more cost effective. However, it should be noted that the security of biometric scanners is much more thorough. They offer the amazing advantage of verifying not only that the person is authorized to go into the area or use the service, but that they are who they say they are. This entry was posted on Friday, October 7th, 2016 at 2:25 pm. Both comments and pings are currently closed.